If you’re lucky enough to have a huge crop of strawberries at your disposal, here’s a selection of recipes and tips. Here are some ideas for using up your strawberry glut in a jiffy. 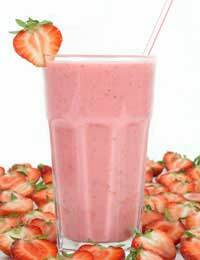 Try a strawberry and vanilla smoothie – blend strawberries, vanilla yoghurt and ice until smooth and chilled. Wash and hull strawberries, and pile them on top of a chewy meringue base for a fast summer dessert. Or make Eton Mess, the simplest of recipes: bash up shop-bought meringues and gently fold into whipped cream and chopped strawberries. Make and bottle your own Strawberry syrup: simmer fresh, hulled strawberries with sugar (1tbsp to every 100g) and a good squeeze of lemon, until mushy. Strain twice – first through a sieve and then through fine muslin. Pour into a warm, sterilised bottle and seal. If you’ll be giving them away, tie the necks with red ribbon. For a twist on the strawberry flavour, add raspberries, blackberries, slices of cucumber, a teaspoon of vanilla seeds, or a couple of sprigs of mint. Try making infusions with other fruits, not just strawberry! These infusions are perfect for giving. Making strawberry liqueur – a sweeter version of strawberry infusions – is another popular alternative. This involves using half vodka and half sugar syrup (which is made by simmering 2:1 sugar:water). So you’re faced with a pile of strawberries, you’ve eaten your fill, and they’re too delicious for giving away. Don’t tip them down the waste disposal. In just half an hour you can transform them into exceptional homemade preserves, with more flavour and pride than anything you could get in the supermarket. Before you start making jam, you’ll need basic equipment: a large (or preserving) pan – a pressure cooker will do; a clean wooden spoon; jars with metal lids or waxed discs. Strawberries have a low pectin content (the ingredient that causes fruit to set), so you will need to add plenty of lemon juice to achieve the right set. Consider blending the strawberries with equal parts of rhubarb, gooseberries, or raspberries. These have extra pectin, which will improve the final set. For effective preservation, recipes usually call for an equal amount of fruit to sugar. You may not wish your jam to be this sweet – just reduce the sugar to ¾, store the jam in the fridge and eat it a bit more quickly. You’ll still have a good few months. To seal, cover with a metal lid OR a waxed disc – don’t use both. Modern metal lids are sufficient to create an airtight seal. Wait until the jam cools before labelling it with name and date. A good book on the basics of jam-making is ‘Jams, Preserves and Chutneys’ by Marguerite Paten.